A team from the International Monetary Fund (IMF) during regular review of the Korean public policy and economy expressed concerns about the pace of increases in the minimum wage in Korea. 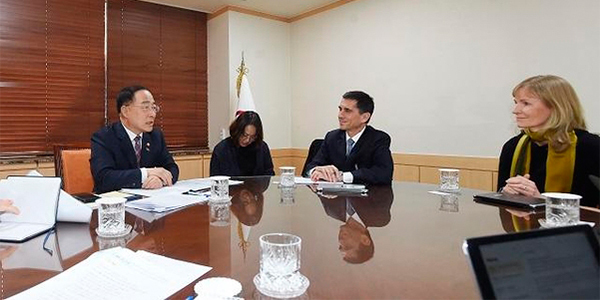 The IMF delegation led by Necmettin Tarhan Feyzioglu met with Finance Minister Hong Nam-ki on Monday and noted the double-digit gains in the minimum wage over the last two years. The minimum wage went up by 16.4 percent in 2018 and another 10.9 percent in 2019 under the liberal Moon Jae-in administration`s desire to achieve hourly minimum pay of 10,000 won ($8.9) within the first three years. The team assessed that Korea has strong fundamentals such as skilled workforce, solid manufacturing base, stable financial system, low public debt, and abundant foreign reserves. However, it raised concerns over the country’s rapid pace of minimum wage hikes and called for more “flexicurity” in the labor market in terms of both minimum wage and working hours. Flexicurity – which combines flexibility and security – is a term that is increasingly being used in the labor market that stresses more flexibility in labor-management relations and at the same time more security for workers. The integrated strategy was first systemized in the Netherlands and was introduced in European countries such as Denmark from mid-1990s. When it comes to job security funds, the IMF mission team stressed in the meeting that the government should focus on providing support to new companies and startups to boost productivity. The finance ministry said that Minister Hong told the delegation that the country will seek to enhance flexicurity in the labor market and improve economic fundamentals to raise the potential growth rate. The IMF, meanwhile, holds annual meetings with member countries on their overall economy-related policies such as macro-economy and finance. The mission team visits government ministries, central banks, and research institutes and discusses economic trends and forecast and government policies in general. The IMF’s annual meeting in Korea took place from February 27 to March 12.